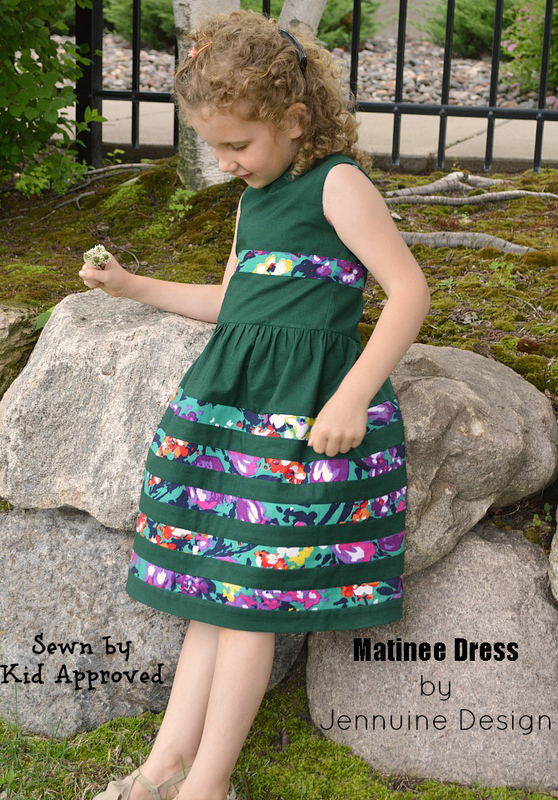 I am excited to be part of the Jennuine Design Matinee dress and top pattern tour. I signed up for the tour a while ago and was thinking of all kinds of dresses I can make. The pattern is adorable. On Tuesday, I realized that my post was due on Friday, and not next week as I thought. Oops. I might have said, "Oh, crap! ", heard an audible gasp from three children and had to apologize profusely for using a bad word. I had to get my act together rather quickly since the preview of the post was due the next day. 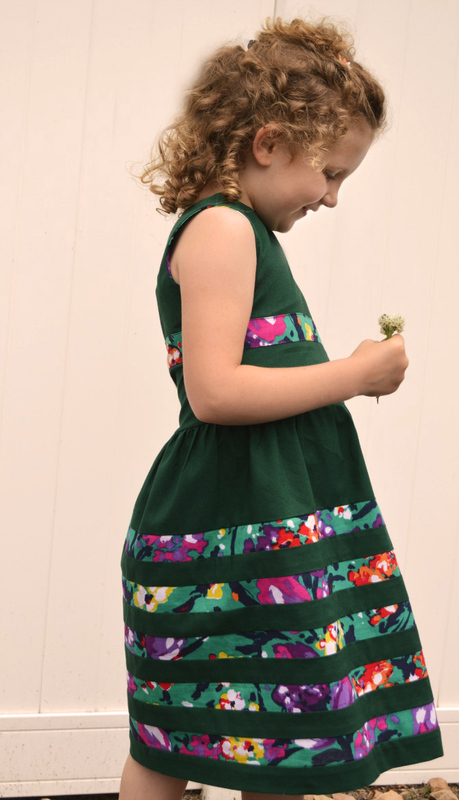 I had an idea of using floral fabric to make striped fabric and then cut out the dress. Well, due to time constrains I just added a few stripes and called it a day. My skirt is also not as full as the pattern suggests. The thought of matching stripes on multiple seams just made me tired. In retrospect, I could have cut the stripes against the grain. The other modification I made is I closed off the back of the dress. I really liked the open back design, and plan to make more dresses in the future. Ania has plenty of summer dresses and she doesn't always wear dresses during summer. The closed back makes it a bit more versatile, she can wear it to school, church, etc. I just closed of the opening and did some adjustments to make it work and look the way I wanted. I was really happy with the pattern, the instructions are clear and easy to follow. The fit is spot on. It is an easy and fast sew, suitable for a beginner. The pattern includes a few options, including sleeves. Check out the incredible creations by other tour participants. So great Olga! The closed back and narrower silhouette give it an entirely different look! Love the stripes, and I agree, a little pattern matching across seams is plenty. The closed back is perfect! And I never would have thought of those floral stripes. So so good! FYI I like the closed back better. Lovely dress! The color suits wonderfully your daughter and the details are amazing! And Jenn as put together a great pattern, hasn't she? Those floral stripes are genious!! Love them! Woooow, such a pretty version and I actually totally love that you kept the stripes to the bottom half of the dress. Beautiful! And I love the closed up back too. I can't believe you did all this in one day!? Go you! love it Olga! the stripes are so clever and eye catching! 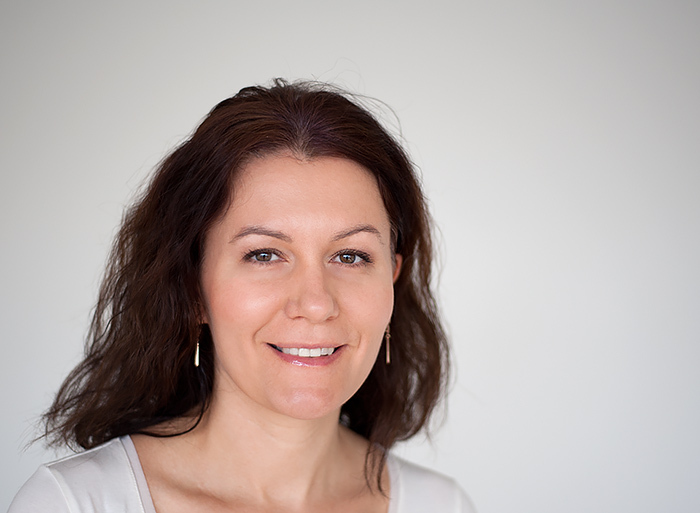 This is gorgeous Olga! I love the contrast strips and they way you used that fabric to cover the buttons too. Oooh, I love this version Olga! So cute! Such a cute pattern. And I love your version. The stripes are so cool!